Amazon Prime has changed the landscape of shopping for many of us. Add Prime Now – a delivery service – and some of us may never go to the grocery store again. Okay, maybe you will go to the grocery store again, but here’s an easy way to save $20 AND get your groceries delivered. It’s not big news any longer but Amazon bought Whole Foods. 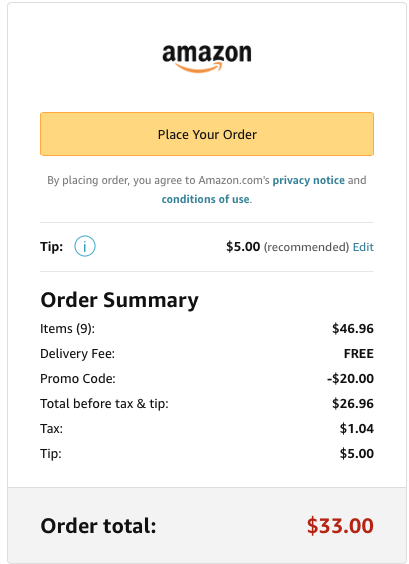 I don’t personally notice much of a savings since their big hype about prices going down, but now you can save some cash by ordering delivery through Amazon at Whole Food and paying with your Amex card. I did it today! Complete payment and wait for your groceries to show up on your doorstep. Here is the fine print of the offer. The key here is you have to use your Amex Card and be a current Amazon Prime member. It was super easy! This entry was posted in Discounts and tagged Amazon, Delivery, Savings, Shopping, Whole Foods by Boulder Families. Bookmark the permalink.